:: The glorious and historic Chelsea Old Town Hall was packed to capacity with almost 400 members of the community, together with some Turkish friends, representatives from the U.K. Houses of Parliament All Party Parliamentary Group for Prevention and Punishment of the Crime of Genocide, the Board of Deputies of British Jews, the Armenian Embassy, His Grace Bishop Hovakim Manoukian, Primate of the Armenian Church Diocese of the United Kingdom and Ireland, numerous other invited dignitaries and Mr Zorik Gasparian, Vice-Chairman of the Armenian Community Council of the United Kingdom. Also present were the Director of the film Nare Mkrtchyan, and the star of the documentary Maya who were in the United Kingdom to attend the screening of The Other Side of Home at the Screening Rights Film Festival in Birmingham from 27 October to 4 November 2017. In the film, the year is 2015. Maya a Turkish lady, who is aware of her legacy as a great-grandchild of an Armenian woman, a survivor of the Armenian Genocide of 1915, realises that she carries a conflict within her. On one side, the story of how the young Armenian woman ( her great-grandmother) was saved by a brave Turkish soldier, how he converts her to Islam and later gets to marry her; and the way in which she raises her children, living a sad life without a smile. The quiet moments when she whispers Armenian songs while hanging the washing in the garden and the constant knowledge of the fact that her great-grandmother at a fragile age of 13, had witnessed the destruction of her family and the entire ethnic Armenian population of the Ottoman Empire. This complex emotional state created the urge in Maya, to travel across the border to Armenia to participate in the Armenian Genocide Centenary commemorations which took place in Armenia as well as by all ethnic Armenian communities throughout the world. This is where Nare the director of the documentary comes into the story. Nare, a young lady, born in Armenia and educated in the USA, whose grandparents come from the same region as Maya’s great-grandmother, decides to travel to Turkey where she meets Maya, and the idea of making a film materialises. They travel in Turkey to Istanbul (Constantinople) to find the house where Maya used to live and the Armenian man named Alex who gave shelter to Maya’s family when they were homeless refugees. They then travel to Armenia and take part in the commemorative events on 23 and 24 April 2015, placing flowers along with over a Million Armenians, at the Dzidzernagaberd Monument built just outside Yerevan in memory of the Armenian Genocide. The emotional state and the complex feelings that Maya experiences are the key features of the documentary. Following the film show there was an opportunity for the audience to ask various questions. Maya and Nare responded to very interesting questions addressing the emotional state of Maya during her journey, changes in her feelings after having visited Armenia, and the experience that she had gone through. Several members of the audience approached Maya and Nare after the show with enthusiasm and admiration, congratulating them on their achievement. 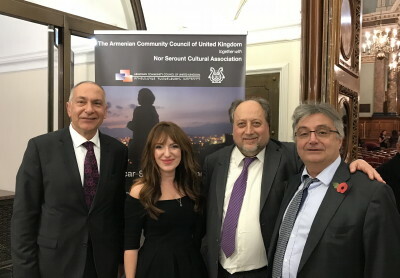 The evening was organised by the Armenian Community Council UK and Nor Serount Cultural Association London. Dr V. Kassemdjian – Chair Nor Serount UK, Zorik Gasparian – Vice Chair ACC UK. of the Armenian Community Council of the UK.